Neuroendocrine tumors of the pancreas (islet cell tumors) are much less common than tumors arising from the exocrine pancreas. Reports often indicate that there are about two to three thousand cases diagnosed in the U.S. each year – although autopsy indicates that there may be a higher incidence of these islet cell tumors than are diagnosed. About 75% of these tumors are “functioning.” That is they are found to be producing symptoms related to one or more of the hormone peptides that they secrete. About one quarter of islet cell tumors do not produce symptoms related to hormone secretion and thus are termed non-functioning. The predominant hormone peptide being secreted gives the functioning islet cell tumor its name. There are a surprising number of these hormonal peptides that islet cell tumors have been found to secrete; some are not even related to the pancreas. This array includes insulin, gastrin, glucagon, somatostatin, neurotensin, pancreatic polypeptide (“PP”), vasoactive intestinal peptide (“VIP”), growth hormone releasing factor (“GRF”), ACTH and others. Some of these are very rare. Apart from producing no currently discernible hormone peptide, non-functioning tumors may include those which produce PP (“PPomas”) or neurotensin (“neurotensinomas), as these hormones usually produce no symptoms. The most common functioning pancreatic endocrine tumors are insulinomas followed by gastrinomas, glucagonomas and VIPomas, respectively. Typically, the symptoms produced by the excess secretion of the predominant hormone in a given functioning endocrine tumor, drives the eventual diagnosis. With the exception of insulinomas, most of the islet cell tumors have fairly similar characteristics-belying the apparent differences caused by the large range of symptom effects related to the secretion of such different hormones. Histologically (under the microscope) they tend to be quite similar. It is not possible to ascertain malignancy from the histological appearance; malignancy is seen primarily as a function of finding additional metastatic sites. Except for insulinomas, very roughly about 60% of islet cell tumors are malignant. This rate contrasts with about 10% of insulinomas which are eventually found to be malignant. The sites of metastasis of islet cell tumors most commonly are the liver and the lymph nodes in the vicinity of the pancreas. Insulinomas are islet cell tumors which secrete an excess of (predominantly) insulin. These tumors will typically first present symptoms between the ages of 40 and 50, are more common among women and tend to be small, solitary tumors located in the pancreas itself. The clinical features of this tumor are related to the effects of insulin-and thus primarily demonstrate symptoms related to hypoglycemia which are relieved by food intake. Other general symptoms include episodic sweating, tremor and rapid heart rate, as well as hunger, nausea, weight gain, and sometimes even central nervous system symptoms (including rarely, seizures). Gastrinomas over-secrete the hormone gastrin. The clinical effect of this circumstance is what has come to be called the Zollinger-Ellison syndrome, a triad of signs and symptoms including atypical peptic ulcer disease, gastric hyperacidity and hyper-secretion, and an associated islet cell pancreatic tumor. About 2% of patients with non-healing peptic ulcers (after receiving an appropriate therapy regimen) are found to have Z-E syndrome with its attendant tumor. Most patients are male (~60%) and the average age at diagnosis is about 60 years. Patients with glucagonomas tend to present with mild diabetes and a severe dermatitis. These tumors are frequently fairly large by the time of diagnosis, sometimes greater than two inches in diameter. Approximately 70% of these tumors are malignant. 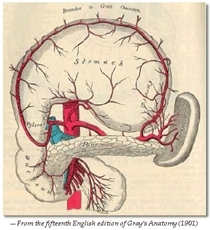 About 80% of VIPomas are located in the pancreas itself-the rest elsewhere. Over-secretion of this vasoactive intestinal peptide causes watery diarrhea, and low serum potassium and chloride levels. Only about 200 cases of this kind of tumor have been described in the medical literature; the majority are malignant by the time of diagnosis. Carcinoid cancer is the most common of the neuroendocrine tumors, with one-and-a-half diagnosed cases per 100,000 of population, although anatomy at autopsy demonstrates about 400 times those that are diagnosed clinically. The symptoms and signs of carcinoid tumors range widely, and depend on the location and size of the tumor, on the presence of metastases, and secretions. They can appear to the surgeon as firm nodules bulging into the intestinal lumen (can originate from pancreas, lungs, thymus, appendix, and ovaries, etc. ), with possible local expansion, and possible metastases to mesenteric lymph nodes, liver, ovaries, peritoneum, testes, prostate, spleen and other anatomic locations. Carcinoid tumors can secrete any number of hormonal, growth and other factors. Symptoms related to the tumor and its factors may be intermittent and vague, but the most common presentation is periodic abdominal pain sometimes accompanied by malignant carcinoid syndrome, characterized by flushing of the face, severe diarrhea, and an asthma episode. The initial evaluation of patients often includes measurement of such factors as serotonin, 5-HT, catecholamines and histamine, and especially urinary 5-HIAA levels. In general, survival rates for patients with carcinoid cancers are related to the size of the primary tumor – and the degree of metastasis. The natural history of islet cell and carcinoid tumors tends to be favorable as compared with pancreatic adenocarcinoma. For example, the median survival duration from the time of diagnosis for patients with non-functioning metastatic islet cell tumors approaches five years. The diagnosis of islet cell tumors is aided by the different abnormal biochemical profiles that they may present, which often leads to radiographic means to try and locate the tumor. It would be a mistake to generalize too much about attempts to locate these tumors. But generally, dynamic CT scans with radio-contrast dye, octreotide scintigraphy, transabdominal ultrasound, and selective visceral angiography are all methods employed to elicit radiographic information about the cancer, depending on individual circumstance. Although they arise from similar cells, these different types of neuroendocrine cancers all behave somewhat differently. The standard treatments tend to be tumor-type specific, but some general observations can be made. Immediate treatment of the symptomatic conditions created by the over-secretion of the hormone(s) may be appropriate. (For example, the use of H2-blockers, omeprazole and even octreotide in gastrinomas). The treatment of choice for localized islet cell tumors is generally curative surgery. The treatment of metastatic islet cell cancer disease, depending on the tumor type, will often include chemotherapy involving such agents as streptozocin, 5-FU, doxorubicin, dacarbazine and octreotide. Recently, there have been published in the medical literature promising studies of aggressive surgery benefiting select cases of metastatic neuroendocrine tumors. Apparently isolated liver metastases have been treated with such creative approaches as hepatic artery embolization. This may reduce the nutrient blood supply to the metastatic liver tumor (which tend to be rather vascular), but this approach remains controversial. It is difficult per the limits of today’s radiographic methods (and even via direct inspection at surgery) to fully appreciate the presence of small tumors in the liver-thus there well may be more metastases that have been undetected. Currently, there are studies employing techniques of radioimmunotherapy to selected patients with metastatic islet cell cancer, wherein radioactive elements have been conjugated together with specific compounds (sometimes hormonal elements) which are chosen for their properties that tend to selectively target islet cell tissue. These are very interesting early studies which hold the virtue of biologic plausibility, but the final results of the efficacy of this approach is not yet fully known. Some percentage of islet cell tumors may be a part of several well-defined hereditary syndromes in which the tendency exists for the development of tumors in various (typically multiple) endocrine glands in the body, and which are known as the multiple endocrine neoplasia (or “MEN”) syndromes. There are several such syndromes as presently defined.